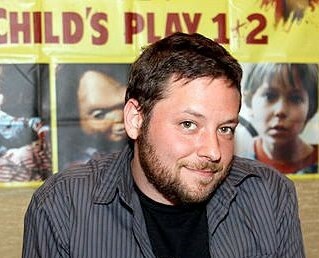 Tijdens de Dark Zone HorrorCon 2016 kreeg ik kort de gelegenheid om enkele vragen te stellen aan Alex Vincent, die we beter kennen als de jonge Andy Barclay uit Child’s Play 1 & 2. In het derde deel deed hij helaas niet meer mee (zie ook interview), maar hij keerde terug in een after credits scene in de meest recente film Curse of Chucky. First of all, how did you, as a 5 year old get cast in a horror movie? Did you audition or were you spotted on the street? I was auditioning. I had an agent and I went to New York City auditioning. I auditioned for a lot of things, not just horror. I did commercials and print work and some television and then I just got the audition for Child’s Play. I got a call back soon and that’s how I booked it. I can imagine it was some kind of a rollercoaster after Child’s Play hit the cinema’s, how was the attention from friends and classmates? Luckily for me most of them were too young to see it at the time, so it was kind of gradual, it was an overwhelmingly, overbearing from the kids I went to school with. Around the time I went to high school I had to answer more questions. I’m not exactly familiar why you weren’t in part 3. Was there a script that featured a young Andy or did they decide to start with an older Andy? Yeah, there never was a script with a young Andy. Originally, the idea, I thought I was going to be in the 3rd one but by the time they wrote the script they wanted him to be older, have a girlfriend, be in military school, and I was only ten at the time. I didn’t go to college right after high school, I went to a school called Fall Sail University in Orlando. It’s an Art school for audio and audio engineering. No, for the first six months that I was there I didn’t tell anybody and then I slowly revealed it to people. That’s my favorite way to do that, to get a reaction after six months of knowing me. I read somewhere that you did several auditions, about 15 I believe, after you graduated, but got rejected all the time. How was that for you? It was more difficult than when I was a kid. You know, you have more insecurities as you get older and that was part of the issue. It made auditioning even more nerve wrecking for me, but besides that I was living in New Jersey auditioning in NYC, so I had to take off of work, to pay for gas and parking and tolls to get into NYC. So every audition ended up between missing work and getting to the city costing me over a hundred dollars and after 10 to 15 time I didn’t feel worth continuing. Yeah, they reached out to me, I didn’t have to audition for that. It was a very very small part. It was just actually a voice over, so it was very simple. And how came your involvement in Curse Of Chucky to be? 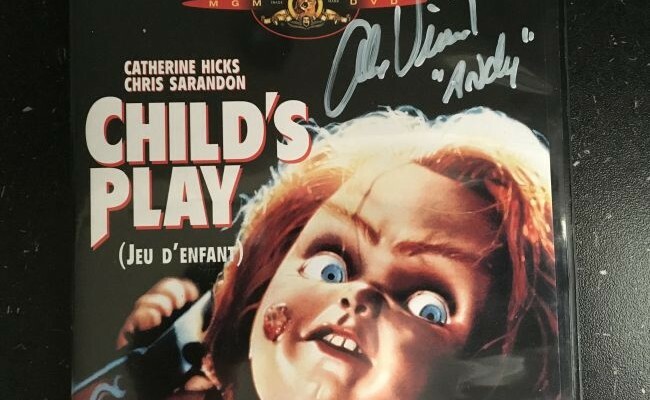 Were you asked back by creator Don Mancini? Exactly, yeah. He just give me a call. You know, It was a call I was just waiting for, hoping for, to hear from him. So he was very excited to tell me. 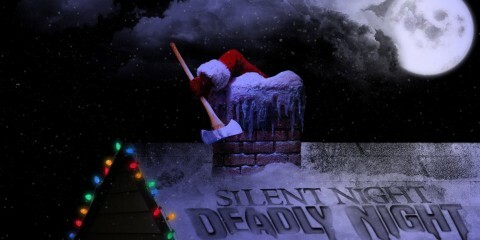 Now I want to know, what’s your favorite scary movie? Uhm, I’m actually not the biggest horror fan despite doing these conventions for twelve years and being part of the genre for nearly thirty. I like scary movies that are possible, that doesn’t include anything supernatural because I can believe it more like the movie The Strangers. People with bags on their heads outside your house. That’s entirely possible, you know. That’s the type of stuff that scares me. You’ve also written the movie House Guest which was already shot, but on your website there’s also mention of a script called Empty Rhodes. What the status of that one? Correct. I’ve written about 8 screenplays actually and Empty Rhodes is one that I’m pretty passionate about and I still do want to see it through to completion. It’s about budget, about finding people that want to invest some money in it. That’s the challenge with a lot of these. Do You often join a horror/movie convention and why? Prior to this interview you told me you like the Netherlands, why and what do you know about the country, besides the obvious things like windmills, tulips, wooden shoes and…ehm.. something to smoke? Ha, to smoke yeah. I’ve been eleven times to Amsterdam and shortly I will be there for the twelfth time. Besides the very obvious reason to like Amsterdam, It’s an incredible beautiful city, the canals and the structures of the properties there. I can get lost walking around that city and be completely blissful and enjoy it. And I’m also very stoned when I’m there, that helps me to enjoy the city. Last February there was talk about shooting a new “Chucky” in South Africa. Can you tell something more about that? Will you be back? What I know I very limited at this point. South Africa never came up in discussions. I don’t think we’re filming in South Africa. I think they probably go back to Canada to film the next one. The last one was shot in Winnipeg. There’s going to be a seventh film, that’s what they’re all talking about. My involvement in it…ehm, is going be last minute. I will be the last one to know. So do I, But I have no clue yet. There are a couple of acting jobs I’m working on this year, mostly low budget and independent stuff. But there’s also a couple of other things, more mainstream type of things. And I’m taking a little bit more of independent work than before, because basically I need the practice. I’ve been out of it for a while and it would be good to get some acting going. And I own a recording studio in Clearwater, Florida. I record bands, do sounds for films. It’s called A/V Productions. And For your upcoming Birthday I brought you a typical Dutch treat. These are called stroopwafels. I had them before, their great, tasty. Thank you. You’re welcome. I Appreciate it. Good Job!